When did you start bikepacking? I don’t really consider myself a mountain biker or a bikepacker or anything like that. I don’t really say “I want to go bikepacking” or “I really want to go skiing.” I plan for trips and then look at the best modes of travel to accomplish them, in the best style. I got into bikepacking or lightweight mountain bike touring when a buddy of mine and I planned a trip to stay at eight different lookout towers in 10 days. We realized going lightweight with mountain bikes would be the best thing for that trip and we just went from there. I had experience with bike touring before that. I think I went on my first bicycle tour 10 years ago. But yeah, now I look at things in terms of where I want to go and what tools I need to pull it off. What’s the appeal of adventures like that? It’s kind of like when you first start riding a bike. Years ago, I remember thinking to myself “I’m going to ride five miles across town. That’s crazy.” You get that unknown feeling of can I do this? It’s exciting. You do that then think maybe I should try a 20 mile ride in the country and get that same feeling. I’m constantly searching for that feeling and trying to push myself on every level–creatively, emotionally, mentally, physically–seeking out interesting trips then accomplishing them. Along the way I photograph them and maybe write about them. I really love the whole process. I remember the first time I did a trip where I put my bike on my back and hiked up over a snowy pass in spring time. I’d been seeing avalanches go down the day before. I was asking “should I be doing this?” and gathering myself physically and emotionally to get up and over. It’s always about finding whether you can accomplish something or not, whether you should accomplish it and when to turn around. That’s the good stuff for me. I want to feel like a little kid and have that excitement and see what I can do. Obviously you’re making maps, but what does it mean to be Adventure Cycling’s cartographer in this day and age of digital everything? That’s a big question. I really like it. Paper products are still very, very relevant. Your map is not going to break. We have our maps on waterproof paper that are tear resistant. You can drop your phone and break it, you can run out of batteries and all that. But that’s not going to happen on a map. We’re selling more maps than ever. People want to take their phone and their GPS too, but it’s a nice comfort to have a real map. When I go out, I usually have some kind of electronic device for wayfinding and usually two different maps for cross referencing. All maps are wrong, essentially. Out in the field, especially when you’re in the middle of nowhere, you’ve got to cross reference everything to figure out what’s going on. It’s sort of neat to be part of that process. It’s also neat to see the electronic stuff come up. I’m definitely into that kind of stuff too. 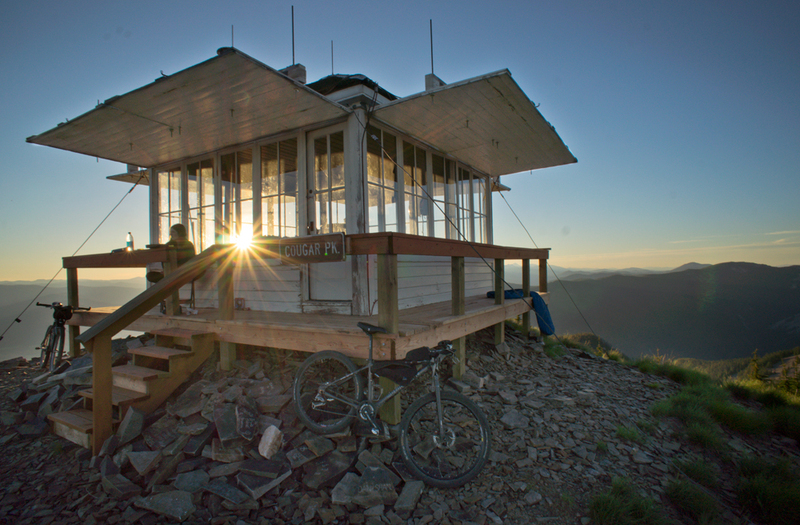 Linking up lookout towers helped inspire the Idaho Hot Springs route. Photo by Casey Greene, via his blog. And what does your job with ACA entail? A lot of people think I’m out all the time on my bike looking for routes. But the reality is I’m sitting behind a desk 40 hours a week. Mostly I’m updating our maps. We have over 40,000 miles of mapped bike routes across the country, all over the place. Most of those are road routes and we have two mountain bike routes now, the Great Divide Mountain Bike Route and the Idaho Hot Springs Mountain Bike Route. We spend a lot of time updating our maps. We have over 90 maps for our different routes. Each one of those individual maps are on a two year cycle to be updated for services. And we still change routing. If someone’s like “hey that wasn’t very good, here’s a different route” we’ll take that into consideration. 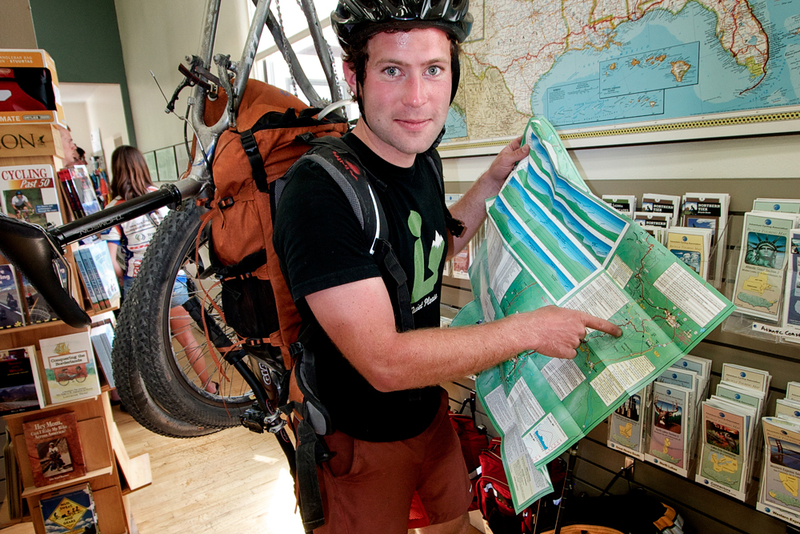 We’re constantly updating our maps to get touring cyclists the best information. I also do most of the mapping for the United States Bicycle Route System. That’s going really well. I sometimes work on our tours maps for our tour department and other little projects that need to be done. I’m sort of the designer in our department of six. I designed the identity for the USBRS. I design covers for maps. 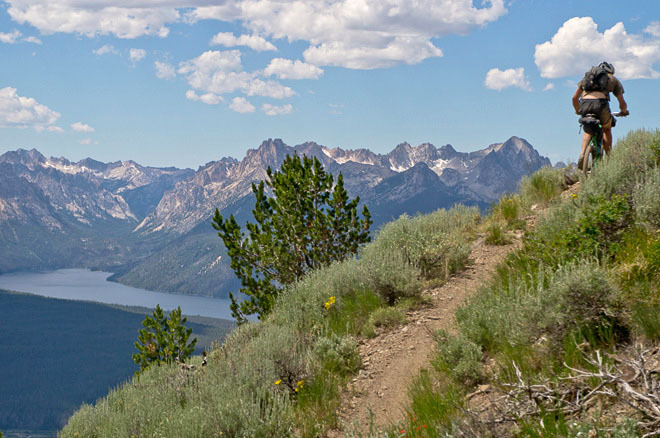 Tell me about your process of creating the Idaho Hot Springs Mountain Bike Route. It was a four year process. I actually got the idea on that first trip to all the lookout towers. I took four days at the end of that trip to ride home from up near Glacier National Park back to Missoula. I really liked linking up these lookout towers as a destination. I started thinking about what else in the Northern Rockies I could link up and had the idea for hot springs. How sweet would it be to do a tour each day to different hot springs? At that time, it was only a personal idea. I work for Adventure Cycling making maps, but I’m also out there doing this stuff on my own. I did a few personal trips linking up hot springs. In the mean time, Adventure Cycling was starting to think about a new mountain bike route. There were people here like me trying to push a new mountain bike route, seeing the mountain bike touring demographic grow and all kinds of people doing all kinds of different trips. It’s not just from the bicycle industry, I saw it from all over the outdoor recreation industry too. There are people who race on the Tour Divide and do these bikepacking races who mainly come from the cycling side of things. But I saw this whole other opportunity with people into the outdoors. Climbers doing touring, backcountry skiers, and others like that. I really thought that it would be very successful if we could get out and give people a really cool route that appeals to a broad spectrum. We got the OK from our board of directors and then went into the process of “can we do this route?” What are the logistics going to be like? What’s the routing going to be? What are the trails and road conditions going to look like? Are there enough hot springs to call it a hot springs route? I did a bunch of research finding the hot springs and everything and put together a preliminary route. We were going back and forth about routing it so you had to ride singletrack. I wanted to make it less exclusive. I’m really happy that we ended up with a main dirt road that anyone who rides the Great Divide can do. Not technical at all. I think basically anyone who bike tours can go do the main route and not be completely out of their element. Maybe they’ll be further out in the woods than they’re used to, but they won’t have to push their bike up climbs or get frustrated with the technical aspects of the ride so much. We were able to add singletrack options for people who wanted to do the lightweight mountain bike touring, bikepacking thing and get out there further and reach more hot springs. We were able to put a spur into the Boise airport so people can just get off the airplane and onto their bike and get going. Finally, I put a paved cutoff that cuts the route in half. It’s all paved and beautiful riding that hits a ton of hot springs. So if you don’t have time to take two weeks off work to do the main route, you can take the cut off and do half the route. I really wanted people to have options to customize their trip. I’m really happy with how the routing turned out. I took a week in the fall of 2012 to drive around on these dirt roads and check out the condition of the hot springs. See if they were going to be adequate for people to soak in, what were the conditions of the road, etc, to get a feel for the whole route. In early 2013 we started building the maps. In the summer of that year a buddy and I went out for a month and rode all of the singletrack sections and drove the rest of the dirt road and paved sections. We worked through the fall and winter getting the map up to speed. It’s a total redesign from our other maps, so a lot of work went into that. Then maps came out in February of this year. A sample of the amazing beauty on the Idaho Hot Springs route. Photo by Casey Greene. Mountain biking is certainly not surfing when it comes to the locals-only, turf war issue, but I gather you ran into a little bit of protest when including some of the trails in the Idaho Hot Springs route. What are your thoughts about publicizing every trail network versus keeping some things available to only those locals in the know? I’m not really concerned with the trails. I had one guy in Ketchum tell me not to put a certain trail on the map, but the trail that guy was talking about gets ridden so infrequently. Some of these trails that are on the route, people in Ketchum don’t even know. I had people saying “oh you’re going to go out there? Let me know how it is!” Most mountain bikers will go and ride the same stuff all the time and not explore. Since that time, there’s been a lot of controversy about them possibly turning that area into a National Monument and there are a lot of wilderness people behind it. If that happened it may kick mountain bikers off the trails. I think the more people ride those trails, the better it will be for keeping it open to mountain bikers. Honestly, the thing I was concerned about and I’m still concerned about is the overuse of the hot springs. A lot of these are natural hot springs. They’re pools that people have dug up and fixed. Volunteers go out and maintain them. But at the same time, every hot spring that’s on the route is a public hot spring that people have known about and have been published in numerous books and online, so we’re not putting any hot springs out there that aren’t already known. There are other hot springs that we didn’t include on the map for various reasons and people can search those out and find them on their own. One aspect of the route that I am excited about is economics of bicycle travel. People are going to bring money to these towns and a lot of them don’t have a lot going on. There’ve been so many economic travel studies published in the last five years by states and academic papers on the economics of traveling by bicycle and what those cyclists bring to town. It’s kind of staggering when the numbers all get added up. I’m excited for the small towns along the route to experience this. Do you have your eye on more bikepacking routes in the near future for Adventure Cycling? Not right now. This is sort of a new thing for us. We’ve never put technical single track on a route. We have the Great Divide route, but on the whole, the organization is very road touring oriented. At this point, we’re going to have to wait and see how people like this route. If we do perceive demand we’ll move forward from there. At this time there’s no plans for another mountain bike route, but I’m sure there will be in the future. This entry was posted in Bike Touring, Interviews, Mountain Biking and tagged aca, adventure cycling association, bikenomics, bikepacking, casey greene, dirt road touring, idaho hot springs bike route, mountain biking. Bookmark the permalink. This is what we need here in Northern New Mexico, it’s difficult to do without shared knowledge of routes. A route like the Idaho would be great here. Looks great. Love to use something like this. Thanks.